Forging is a manufacturing process where metal is pressed, pounded or squeezed under great pressure into high strength parts known as forgings. The process is normally performed hot by preheating the metal to a desired temperature before it is worked. It is important to note that the forging process is entirely different from the casting (or foundry) process, as metal used to make forged parts is never melted and poured (as in the casting process). Forged parts can range in weight from less than a kilogram to 580 metric tons. Forged parts usually require further heat treatment and machining to achieve a finished part. • Hammers with a driving force of up to 50,000 pounds, pound the metal into shape with controlled high pressure impact blows. • Presses with a driving force of up to 50,000 tons, squeeze the metal into shape vertically with controlled high pressure. • Upsetters are basically forging presses used horizontally for a forging process known as "upsetting" and specialize in forming longer parts such as flanged axle shafts, large bolts and pipe & tubing. The earliest signs of metal forging date back to 4500 B.C. in Mesopotamia. Precious metals became valuable in the many civilizations, including the Mayans and ancient Egyptians. These societies used precious metals for jewelry and other ferrous metals, including steel and iron, for tools. During the Dark Ages forging metallurgy grew in popularity because of the ever-expanding need for new and better weapons. Originally, metal working involved the laborious task of manipulating the work piece by hand with hammers and the use of heat to soften the metal to be formed into shapes. Between the 10th and 12th century A.D. the Romans began using water power to aid in the forging process. As time passed, metal working technologies advanced and metal-smiths became a very important part of society. The need to find and work with metals also increased as society grew. The traditional blacksmith shops or “smithies” have evolved over centuries into specialized manufacturing facilities with computer-aided engineering processes, high-capacity production equipment, tooling, raw materials and products to meet the demands of modern industry. Industrial forging in the 21st Century is done either with mechanical & hydraulic presses or with hammers powered by compressed air, electricity, hydraulics or steam. These hammers may have reciprocating weights in the thousands of pounds while press capacity is usually measured in tons per square inch. The forging process can create parts that are stronger than those manufactured by any other metalworking process. This is why forgings are almost always used where reliability and human safety are critical. But you'll rarely see forgings, as they are normally component parts contained inside assembled items such as airplanes, automobiles, tractors, ships, oil & gas drilling equipment, engines, missiles and all kinds of capital equipment. Some of the largest customer markets include: aerospace, national defense, automotive, oil & gas exploration, power generation, heavy truck, agriculture, construction, mining, material handling, and general industrial equipment. • Casting cannot obtain the strengthening effects of hot and cold working. Forging surpasses casting in predictable strength properties - producing superior strength that is assured, part to part. • A casting has neither grain flow nor directional strength and the process cannot prevent formation of certain metallurgical defects. Pre-working of forge stock (such as the hot-rolling of bars at producing mills) produces a grain flow oriented in directions requiring maximum strength. Dendritic structures, alloy segregation's and like imperfections are refined in forging. • Casting defects occur in a variety of forms. Because hot working refines grain pattern and imparts high strength, ductility and resistance properties, forged products are more reliable and are manufactured without the added costs of tighter process controls and inspection required for casting. • Castings require close control of melting and cooling processes because alloy segregation may occur. This results in non-uniform heat treatment response that can affect straightness of finished parts. Forgings respond more predictably to heat treatment and offer better dimensional stability. • Welded fabrications are more costly in high volume production runs. In fact, fabricated parts are a traditional source of forging conversions as production volume increases. Initial tooling costs for forging can be absorbed by production volume and material savings. Forging’s intrinsic production economics lower labor cost and reductions in scrap, rework and inspection. • Welded structures are not usually free of porosity. Any strength benefit gained from welding or fastening standard rolled products can be lost by poor welding or joining practice. The grain orientation achieved in forging makes stronger parts. • A multiple-component welded assembly cannot match the cost-savings gained form a properly designed, one-piece forging. Such part consolidations can result in considerable cost savings. In addition, weldments require costly inspection procedures, especially for highly stressed components. Forgings do not. • Selective heating and non-uniform cooling that occur in welding can yield such undesirable metallurgical properties as inconsistent grain structure. In use, a welded seam may act as a metallurgical notch that can lead to part failure. Forgings have no internal voids that cause unexpected failure under stress or impact. • Welding and mechanical fastening require careful selection of joining materials, fastening types and sizes, and close monitoring of tightening practice both of which increase production costs. Forging simplifies production and ensures better quality and consistency part after part. • Sizes and shapes of products made from steel bar and plate are limited to the dimensions in which these materials are supplied. Often, forging may be the only metalworking process available with certain grades in desired sizes. Forgings can be economically produced in a wide range of sizes from parts whose largest dimension is less than 1 in. to parts weighing more than 450,000 lbs. • In most cases, forging yields a grain structure oriented to the part shape, resulting in optimum strength, ductility and resistance to impact and fatigue. Machined bar and plate may be more susceptible to fatigue and stress corrosion because machining cuts across the material grain pattern. • Forgings make better, more economical use of materials. Flame cutting plate is a wasteful process one of several fabricating steps that consumes more material than needed to make such parts as rings or hubs. Even more is lost in subsequent machining. • Forgings, especially near-net shapes, make better use of material and generate little scrap. In high-volume production runs, forgings have the decisive cost advantage. • As supplied, some grades of bar and plate require additional operations such as turning, grinding and polishing to remove surface irregularities and achieve desired finish, dimensional accuracy, machine-ability and strength. 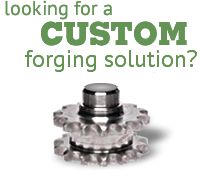 Often, forgings can be put into service without expensive secondary operations. • Low standard mechanical properties (e.g. tensile strength) are typical of P/M parts. The grain flow of a forging ensures strength at critical stress points. • Costly part-density modification or infiltration is required to prevent P/M defects. The grain refinement of forged parts assures metal soundness and absence of defects. • Special P/M shapes, threads and holes and precision tolerances may require extensive machining. Secondary forging operations can often be reduced to finish machining, hole drilling and other simple steps. The inherent soundness of forgings leads to consistent, excellent machined surface finishes. • Forgings offer greater design flexibility. P/M shapes are limited to those that can be ejected in the pressing direction. Forging allows part designs that are not restricted to shapes in this direction. • Forgings use less costly materials. The starting materials for high-quality P/M parts are usually water atomized, pre-alloyed and annealed powders that cost significantly more per pound than bar steels. • New advanced-composite part designs may often require long lead times and substantial development costs. The high production rates possible in forging cannot yet be achieved in reinforced plastics and composites. • RP/C physical property data are scarce and data from material suppliers lack consistency. Even advanced aerospace forgings are established products with well-documented physical, mechanical and performance data. • Forgings offer broader service temperature range. RP/C service temperatures are limited and effects of temperature are often complex. • Forgings offer more reliable service performance and out-perform composites in almost all physical and mechanical property areas, especially in impact resistance and compression strength.